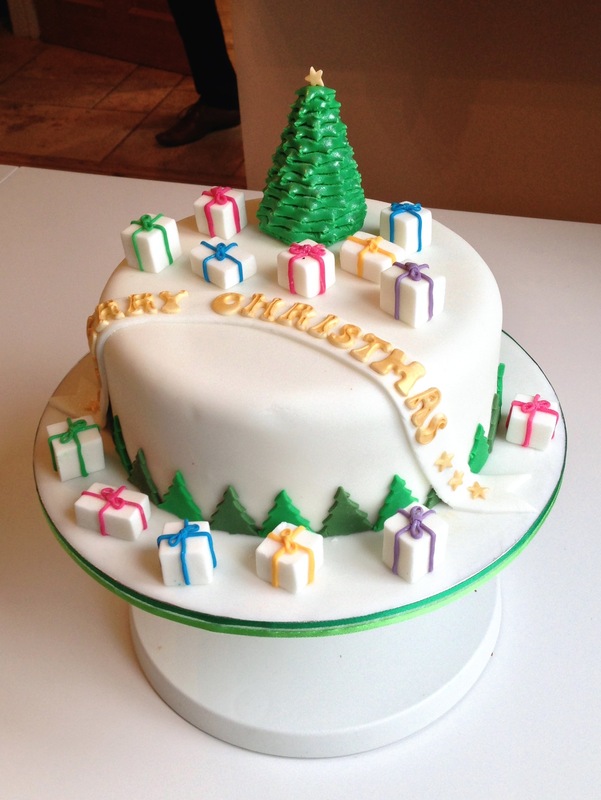 This is the Christmas Cake I made for the family this year. 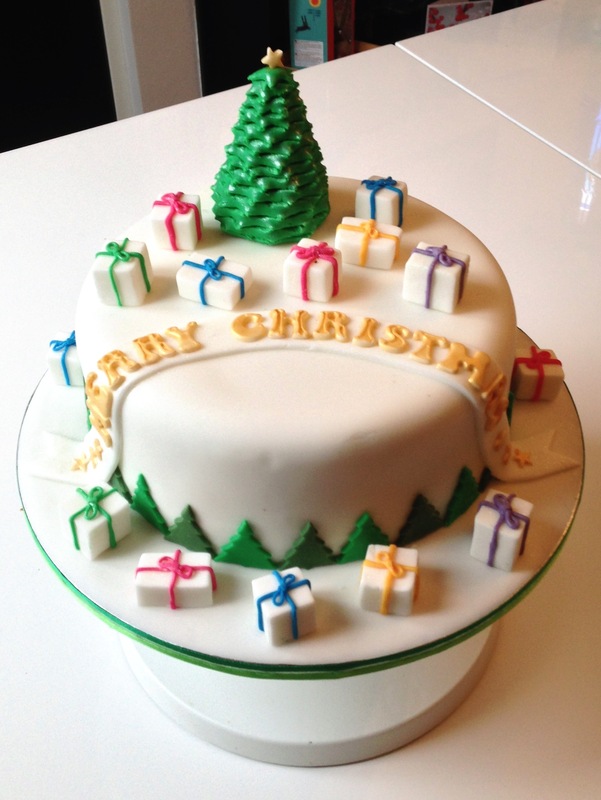 It was the usual Fruit Cake recipe wrapped up in its marzipan and sugarpaste coat. To make the little Christmas presents I used a very sharp knife to cut varying sized cubes of white sugarpaste, which I then left to dry out and harden overnight. The gift ribbon detailing was made by rolling different coloured sugarpaste into very, very thin sausages which I wrapped around the now solid cubes. I added figure of eight shaped loops to the top to create the bows. The large Christmas Tree on the top was created by following this YouTube video. it was actually much easier than I had anticipated and I was really pleased with the results even after my first go. I then finished it off with some some edible sparkle dust to give it a bit of pizzazz, before putting to one side to dry out and harden. To put the cake together it was simply a case of positioning the pieces on the cake and the sugared cake board. 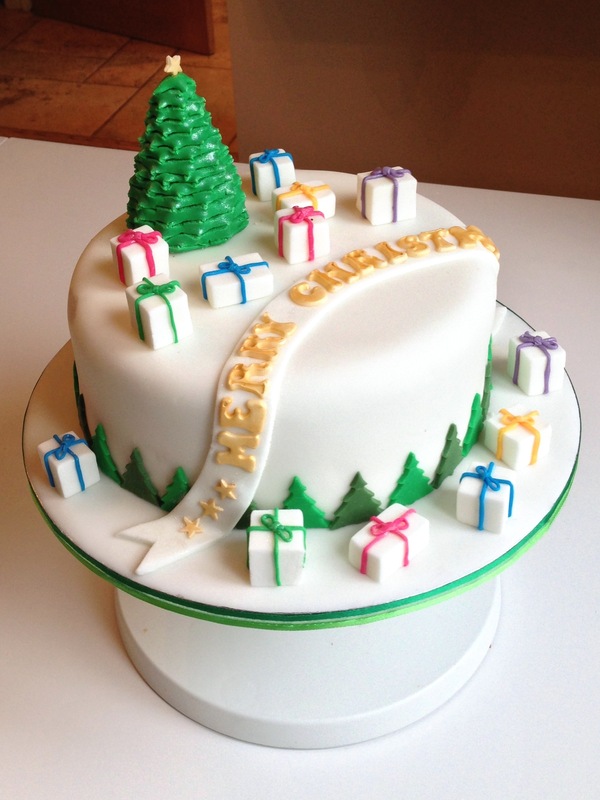 The final touches were the Christmas Trees around the bottom edge (cut from two different shades of sugarpaste rolled to 1-2mm thick). These were to disguise the join between the cake and the board. I also added the Merry Christmas banner across the top which was cut from white sugar paste with lettering brushed with gold edible dust.